Today we are taking a closer hands-on look at one of IWC’s Jubilee Collection releases for 2018, their 150th birthday. We covered the Jubilee models earlier, but we had the opportunity to see them ‘in the metal’ at the SIHH 2018, and so are able to share some photos and thoughts with you. The IWC Tribute to Pallweber Edition 150 Years is the ‘headline piece’ of this commemorative collection. Inspired by Pallweber digital-read pocket watches that were first released in 1884, it represents a technical first for IWC but also revives one of the company’s historical models. 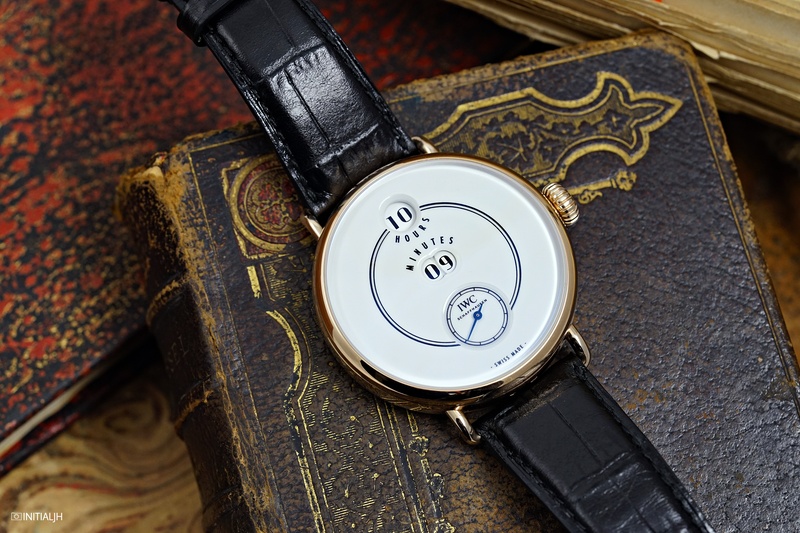 As mentioned in our earlier post, the ‘Pallweber’ after whom the watch is named was Josef Pallweber, a watchmaker in Salzburg who created pocket watches using this rotating disc system of time display. At the time, about 20,000 were made by IWC. This 2018 model comes in a 45mm rose gold case and uses a new movement with a patent-pending disc system, the manual-wind Calibre 94200, which has a power reserve of 60 hours. As you can see, there is also a special ‘150 years’ commemorative medallion on the movement. This movement has a separate wheel train with its own barrel that drives the minutes disc, with a release mechanism connected to the main wheel train unlocking (then locking again) the train every 60 seconds. Every tenth minute, the single-minute disk moves the 10-minute disc forward by one position. So, what is it like in the flesh? Well the modern IWC doesn’t tend towards small watches, even for their dress watches, and this is a decently sized 45mm. However, it actually doesn’t feel or sit as large as many 45mm watches do, sitting almost akin to cases a couple of mm smaller. In part this is because of the roundness of the case/ bezel, which is rather elegantly done. As a choice of a headliner watch for the Jubilee Collection it is an unexpected one, but its difference has worked in its favour, because it is an attention-grabber. It is also, as you can see, very photogenic. Released in a limited edition of 250 pieces, the RRP for the Tribute to Pallweber is 30,000 CHF.